First impressions count for a lot – How the front of your house looks can deter how people think the inside looks. 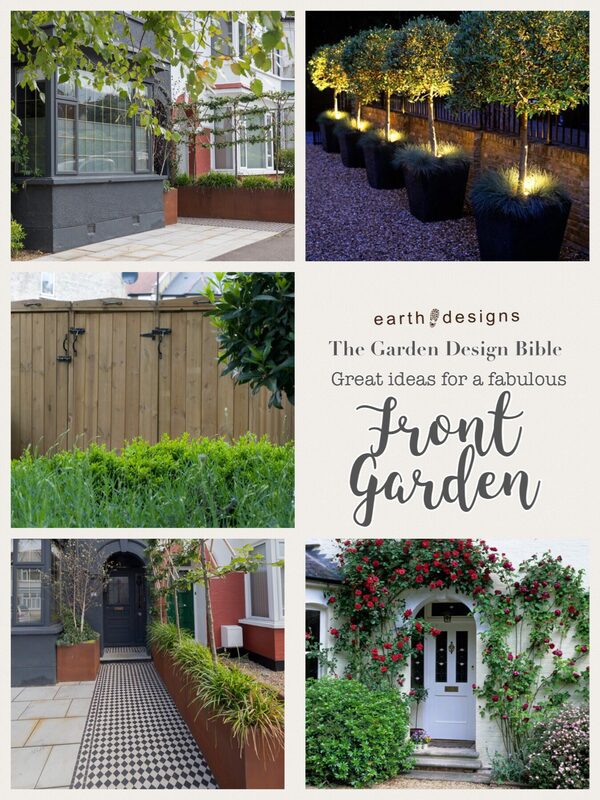 That is why we have written this guide on front garden ideas. Creating a good impression is important. My house is painted black and magnolia. People slow down as they drive past and although it might not be everybody’s cup of tea, it certainly gets noticed. Front gardens need to be a lot of things as well as attractive. Where are you going to store your bins? Do you need to park a vehicle in front of your house? If you are short of space, how can you get the most from it? Be honest, if you have no time to go in your back garden you won’t be on your front. Pick plants that are bullet-proof. What are your boundaries like with your neighbours? 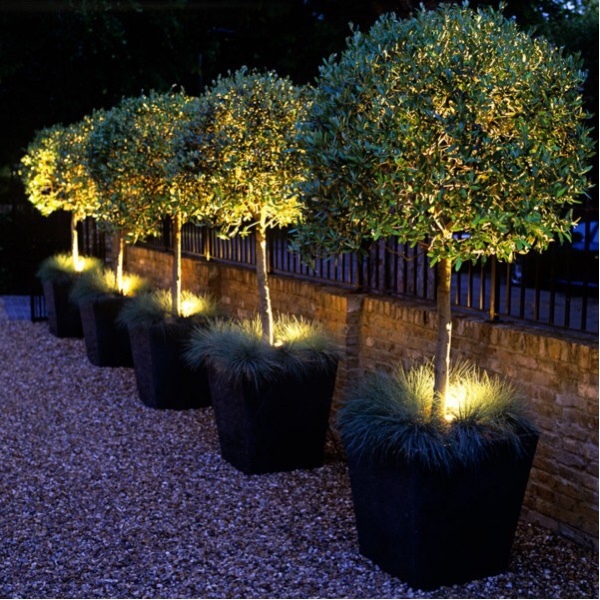 As well as security lighting, considers the accent lighting to make your front garden come alive when the Sun goes down. Trees can eliminate pathways to give a warm glowing atmosphere to your frontage. The bigger the better. Nothing looks worse the dying hanging baskets or window boxes. If you have a big planter, it will need less water. This is a great opportunity to use colour or a different material to really create a talking point. The colour of your house is the backdrop to your front garden. If you have lovely brickwork and gorgeous window frames Lucky you. If, like us, you are subject to pebble dash, Cover it up. 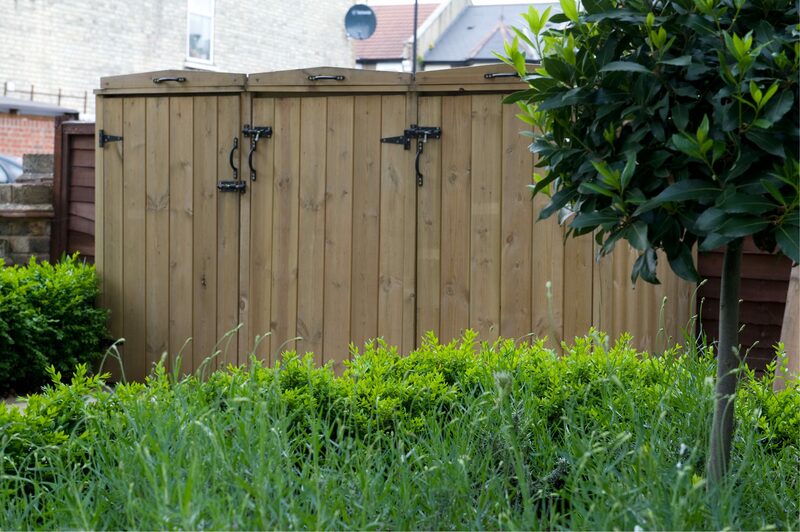 Consider painting the whole house, including the frames dark colour to offset any planting that you do in front. It will pay off in spades. One of our most important front garden ideas. No matter how lovely the outside space looks, if you have to accommodate unsightly wheelie bins it would detract from the whole effect. Invest in a good quality bin store, and then soften it as much as possible with planting. It will make it disappear. This will most likely be the main area of hard landscaping to the space. Make sure it is neat and tidy and weed free. 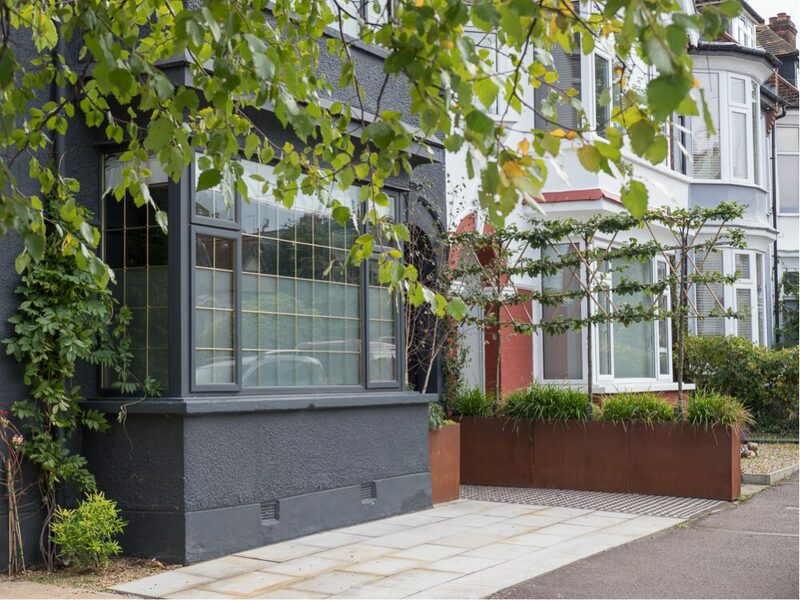 If you have the luxury of a large front garden, consider making a winding path through the space to give journey and allow some exciting opportunities for planting. 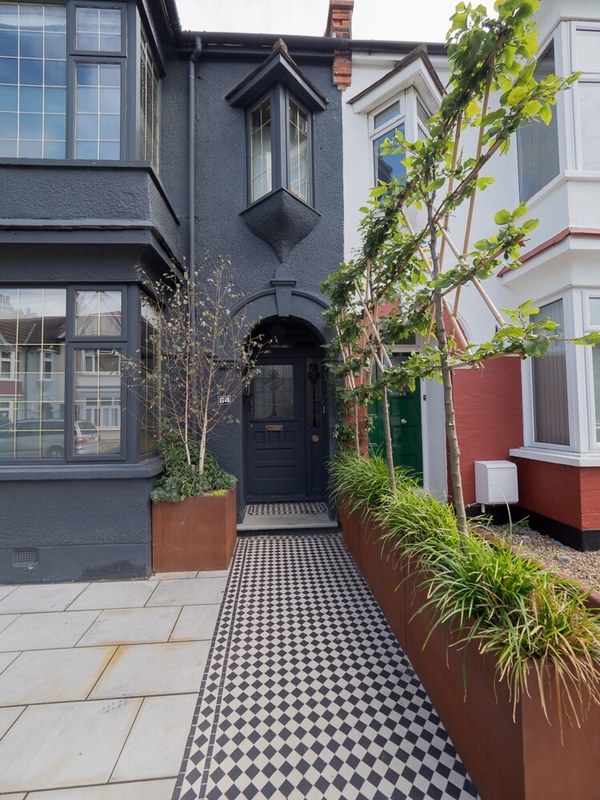 In this garden, we really packed a punch with some Victorian tiles with a modern twist. 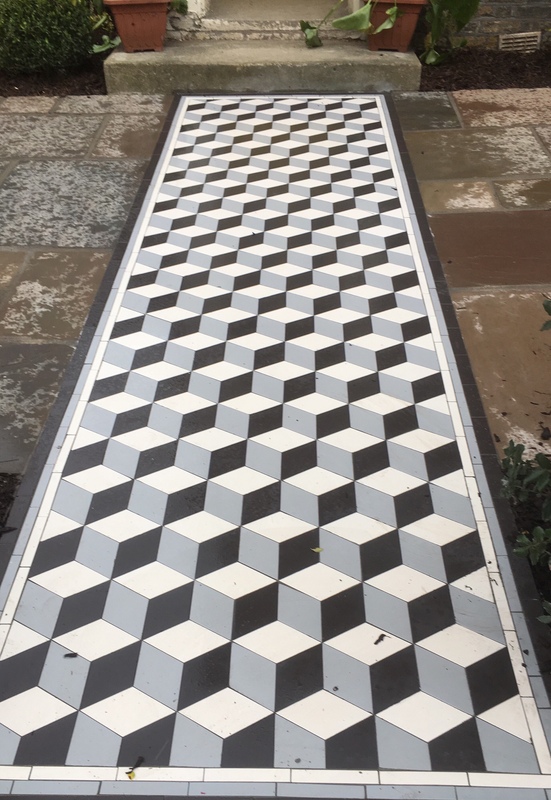 You can mix-and-match pathway materials with other slabs in your front garden ideas. Super-size something. A massive tree helps to offset the imposing building beyond and soften the whole area. Add structure with some year-round evergreen plants such as boxes, conifers or ferns. 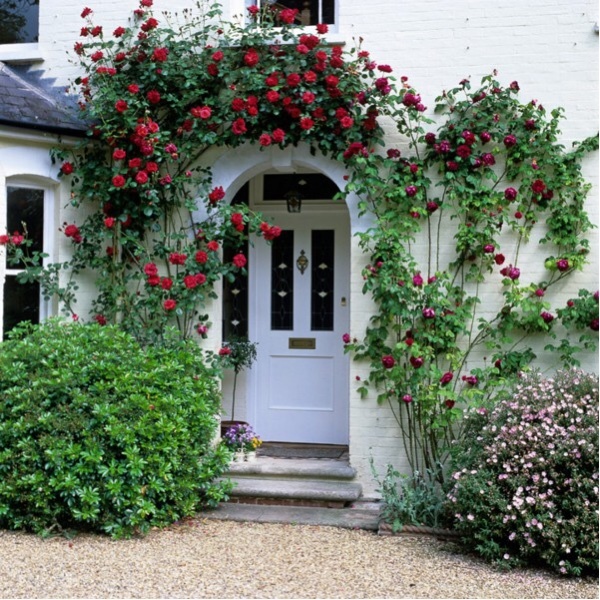 Consider planting a climber at the house, taking care to select the right one so not to compromise brickwork or masonry. Scented plants work well next to a pathway for over a doorway. Keep your colour scheme simple and use plants to soften as much as possible. Check out our How To blogs here.